Just last week I told you about the Bank of Canada’s reluctance to hike interest rates. There’s no doubt the economy isn’t ready, anemic growth, massive debt, and, well, a one trick pony (real estate) keeping it afloat. The argument wages on amongst economists whether it would be more prudent to deflate the bubble now, or keep it elevated and try to hold out long enough for the rest of the economy to recover to replace real estate as the economic driver. Big shoes to fill. 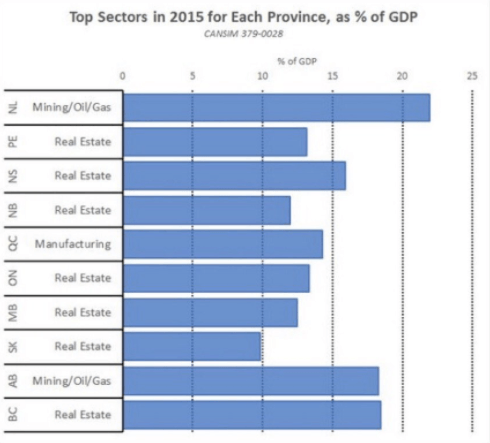 Of the 10 Canadian provinces, real estate is the top producing sector as a percentage of GDP for 7 of the 10 provinces. In BC it accounts for nearly 20% of GDP. Real Estate as a percentage of GDP in Canadian provinces. And so the show must go on. Condos are exploding, detached homes are heating back up. The exuberance is pushing into areas that should signal warning bells. The area of Whalley is experiencing a 99% sales/actives ratio. That means anything that even slightly resembles shelter is selling, likely in multiple offers. Condos in Abbotsford are up 38% year over year according to the MLS benchmark. Last I checked there was plenty of land in Abbotsford. Thing have become equally unhinged in Toronto where prices have soared 33% year over year. A stench of recency bias fills the air, according to a CIBC poll 54% of Canadians think house prices will rise indefinitely. This is classic bubble psychology. Meanwhile, 52% of millennials don’t believe they’ll ever own a home. Cities like Vancouver are already hollowing out. Hourly earnings have barely budged, increasing by less than 1.3%, that’s below inflation- not to mention the surge in housing costs. Previous articleHow Fast Are Vancouver Condos Selling?